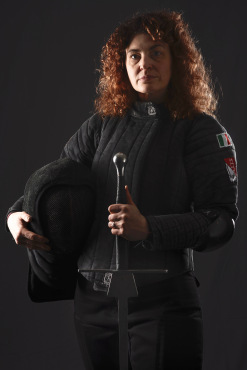 VERONA, IT – Michela D’Orlando, a name most seasoned HEMA practitioners recognize, has fought over 120 competitive longsword matches in her decorated HEMA career. She is currently ranked 4th in the world for women’s longsword according to hemaratings.com (as of July 26th, 2018) and recently claimed her 21st longsword medal at the Albion Cup in Dorking, UK. She currently trains in Verona, Italy with Ordine delle Lame Scaligere, where she maintains her focus on tournament training. This powerhouse and competition veteran allowed us to pick her brain to find out what it’s like to be one of Europe’s most active female fighters. Women of HEMA: Thank you for your time, Michela. First of all, congratulations on medal number 21! That is no small feat, how does it feel to have such a mighty hoard of medals? Michela D’Orlando: Haha thank you, surely there are more decorated fencers. Feels like… 22 would be a better number? I don’t like to dwell on what’s already been accomplished. The medals I think about are always the ones I haven’t gotten yet. Open night alle Lame Scaligere!